Here is my Vintage Pattern Contest entry. 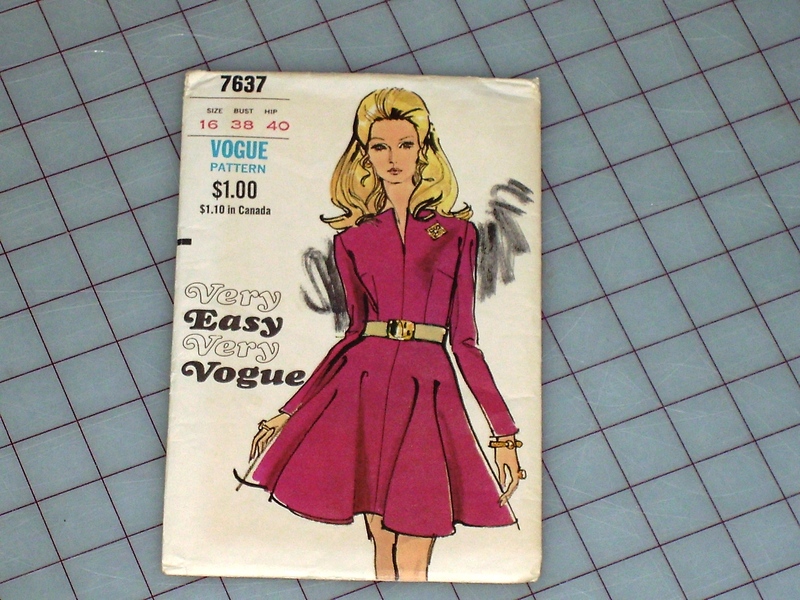 I chose Vogue 7637 from 1968. Now there isn’t too many pictures because it is just too hot to wear a wool dress for any length of time. 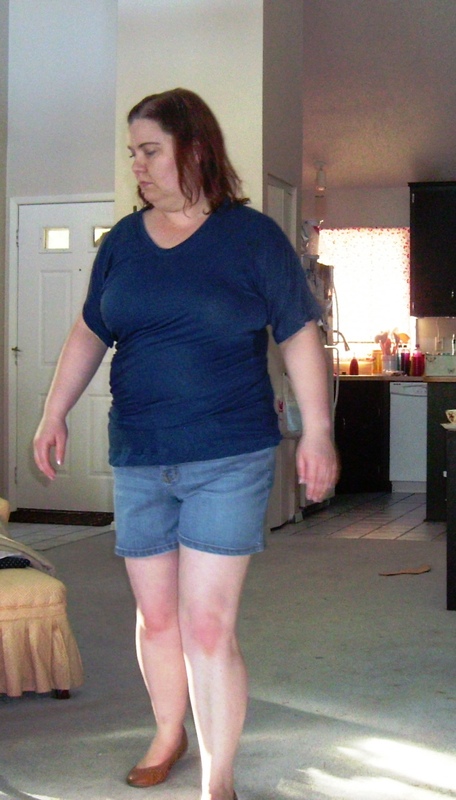 My pattern is a size 16 (bust 38, waist 30, and hips 40). I was fairly confident that the bust area would be fine but the waist is definitely too small. I used the hinge method and added 1.5 inches to each side seam (front and back). It may have been a little too much but at least it doesn’t look like the dress is a tent on me. Anyways, it was better too large than too small. The length was shortened but I can’t remember if it was 3 inches or if it was 4 inches. So the other area that I did pattern modifications to was the sleeve. The original sleeve pattern looked too small. Measuring at the bottom of the arm curve, I think it was around 14.5 inches. Trying to measure myself, it looked like I needed 17 inches. I split the pattern down the shoulder line then right under the arm hole curve and spread the additional 3 inches. Unfortunately they were not the right changes as now the sleeve doesn’t feel right. It is too tight when I move my arms. I think it is because I made the sleeve head shallower. The length of the sleeve is fine though. But honestly, any more sleeve alterations will have to wait until it is cooler outside. I think some of my fitting troubles is because even in the air-conditioned indoors, it is just too hot that one always feels clammy. I actually picked up the Drape Drape 3 book first but wasn’t certain if there was a great starter pattern in it for me to make. Therefore, I ordered Drape Drape 2 next. I have seen several version of top number 4 on the internet and it looked like a good starting point. Something not so overly dramatic that it isn’t wearable every day and as few of pieces as possible. I did cut a trial out since I am above the limits of the X-Large. The only change made before the trial was to raise the neckline. I raised it by 4 inches. For the trial, I never put in the neckband piece. 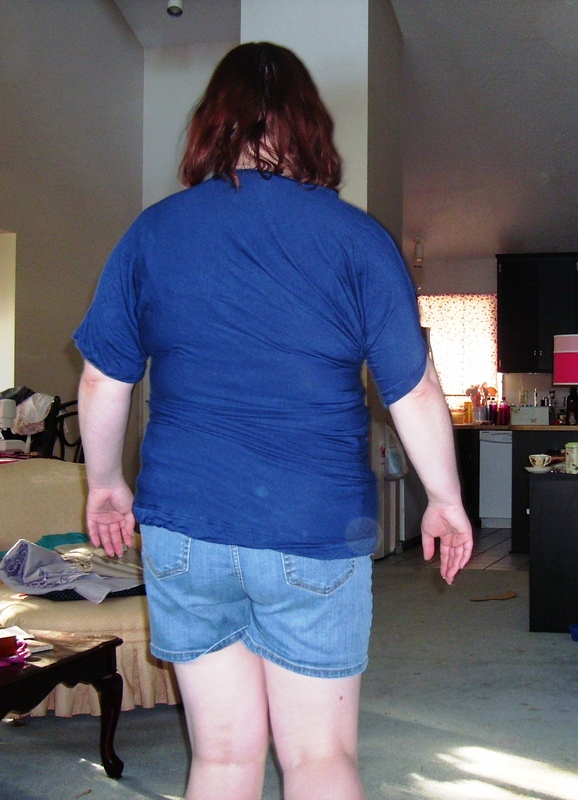 From the trial, I decided I needed a little more width in the hips. Also the right sleeve opening was a little tight. The left side was cut along the seam allowance then hinged out about a half-inch (on both left sides). Then I sliced the fold line on the right side and added a half-inch in there. To make sure that the right sleeve opening wasn’t too tight, I added a little to the sleeve opening and tapered back to nothing at the neckline (on both right sides). There are no pictures of the trial because I used the same navy blue fabric for it as I did for the final version. On to construction, this is a fairly easy top to put together. I did add quarter-inch clear elastic in the shoulders of the top to help keep the shape of the shoulders. Since, I raised the neckline, the neckband dimensions given in the book would not work anymore. I measured a new neckline length of 28.75 inches. I used a 24.5 inch by 2 inch neckband. Before final hemming, I tried on the top. The length was near where I like tops to be at. So instead of turning under the hem, I drafted a hem band of 46 inches by 3 inches.